Though commonly associated with the name Albert Einstein, Samuel Tolver Preston published the formula E = mc2 in 1875, four years before Einstein was born. Unlike Einstein, Preston fully grasped the significance of the tremendous store of energy the equation represents. He engineered machines to take advantage of the energy source, including the atomic bomb. In 1875, Samuel Tolver Preston calculated the mass-energy equivalence with the equation E = mc2 in his book PHYSICS OF THE ETHER, which is republished in full. He proposed methods of obtaining atomic energy and generating superconductivity. Adopting the mechanical gravitational theory of George Louis LeSage, S. Tolver Preston presented a comprehensive physical theory of gravity and electromagnetism, analogous to the kinetic theory of gasses and based upon an aether composed of subdivided matter, whose particles travel at light speed and possess the energy of their mass times the speed of light squared. Preston's works forecast and inspired numerous discoveries and technologies that would shape the Twentieth Century. He wrote almost exclusively in highly polished prose and the non-mathematical reader will find it easy to understand his writings. Preston was an eloquent proponent of science and championed female collegiate education in the 1880's. In another anticipation of the theory of relativity, he fully relativized unipolar induction in the same terms Albert Einstein would repeat decades later as justification for a new theory of the electrodynamics of moving bodies known as the special theory of relativity. His insightful and creative articles were eagerly sought by journals around the world and inspired other authors of science, as well as science fiction. In addition to Christopher Jon Bjerknes' history of Preston and his innovations, the book republishes an extensive collection of Preston's works, including Preston's books PHYSICS OF THE ETHER and ORIGINAL ESSAYS, and 116 thought provoking and historically important journal articles and letters to the editor. 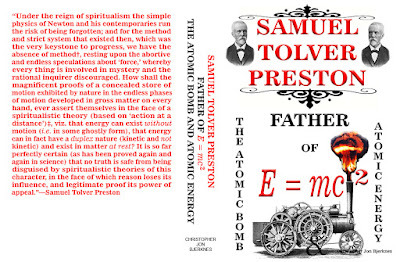 SAMUEL TOLVER PRESTON: FATHER OF E = mc2, THE ATOMIC BOMB AND ATOMIC ENERGY by Christopher Jon Bjerknes is the first and only account and collection of Samuel Tolver Preston's works and achievements. It is an unprecedented and long overdue documentation of this largely forgotten genius and his many significant accomplishments, which cannot be found anywhere else. My book is also available from Kindle as an ebook.